Background: The epidemiological ICDAS system allows caries lesions to be categorized from their earliest stages, dividing them into cavitated and non-cavitated lesions; the possibility of performing non-operative work. These injuries are the sign of a multifactorial disease that must be treated individually according to the needs and conditions of each individual. The ceod index, although it has a high reliability, limits its discrimination to a frank cavity, which reduces the possibility of non-invasive work. Method: 103 children between the age of 2 and 5, coming from a high social economic level, have been evaluated in private kindergartens. Thanks to an intra oral exam the presence of caries, categorized according to the ICDAS epidemiological and ceod system. Results: According to ICDAS epidemiological the following was found: 86 patients (83,5%) with non-cavitated caries lesions, 14 healthy patients (13,5%) and 3 patients (2,9%) with cavitated caries lesions. The ceod index shows that only 2,9% of the children are sick and 97,1 % are healthy. 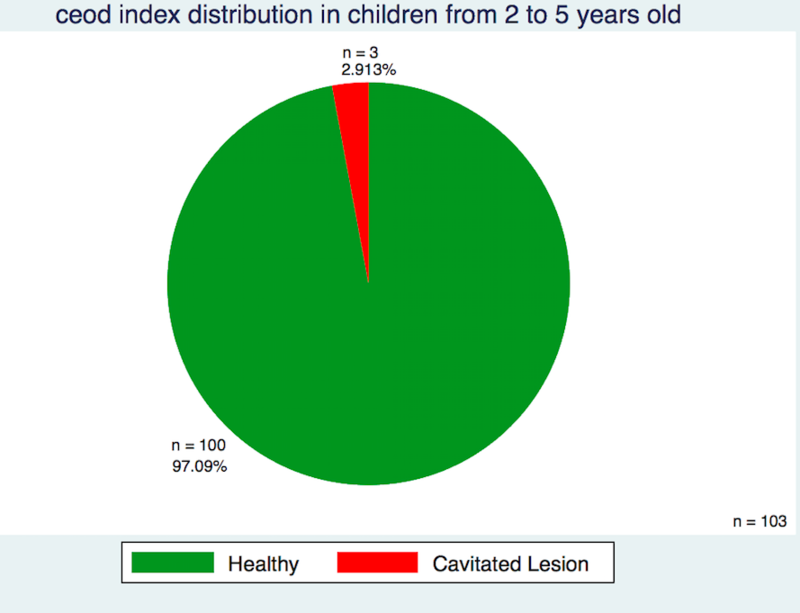 Conclusion: There is a big prevalence of caries lesions in its initial stage; Risk focus and non-cavitated lesions detection is primordial for the prevention of future lesions and it is essential to establish a treatment plan focusing on a minimal intervention based on the patient’s individual risk.